Joey Villagomez, born and raised on Chicago’s South Side has been performing stand up comedy for a little over 9 years and is starting to rise fast! 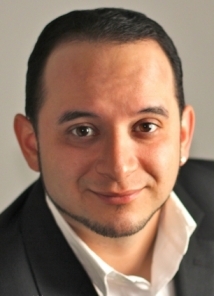 He was featured on Paul Rodriguez’s Latin Kings of Comedy Show in October of 2013.Joey also appeared in HBO Latino specials,Habla and Habla Mas en Chicago in 2007 and performed in the TBS Just For Laughs Festival in 2010 and 2011. He has performed for big corporate events that include the U.S. Census Bureau and received recognition from the U.S. Department of Homeland Security for his participation in the 2012 Hispanic Heritage Month Celebration. Joey was inspired by many comedy legends like George Lopez, Richard Pryor, Martin Lawrence, Eddie Murphy and is a favorite at all the mainstream comedy clubs such as The Improv Comedy Clubs, Zanies and the World Famous Laugh Factory! He says there’s nothing in the world he’d rather be doing than making people laugh!